God looked around his Garden and found an empty place.He then looked down upon his earth and saw your loving face. MA [English literature, English language and Bank Administration]; PhD. 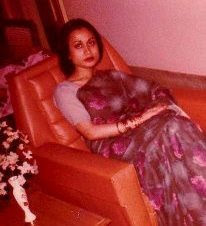 A rare combination of beauty and brains, a stunner with three masters degrees, author of five books, anchor person, eminent columnist, successful bureaucrat, a loving mother and a favourite with the electronic media, Parveen died at the prime of her life. A recipient of President’s Pride of Performance for literature, Parveen, in fact, was one of the few lucky ones recognized in her lifetime. 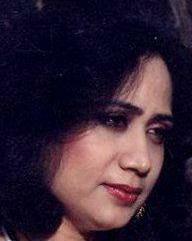 Poetess Parveen Shakir was born on 24 November 1952 in Karachi, Pakistan. 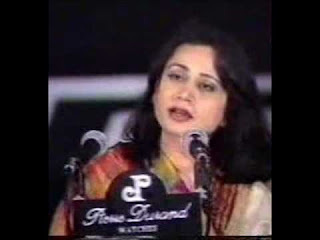 Perveen Shakir was highly educated. 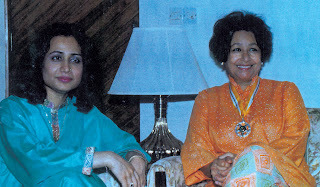 She received two undergraduate degrees, one in English literature and the other in linguistics, and obtained MA degrees in the same subjects from the University of Karachi. She also held a PhD, and another MA degree in Bank Administration. 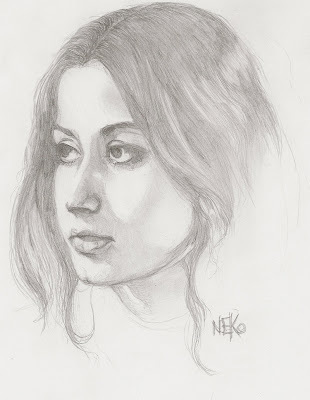 In 1982, Shakir sat in, and passed, the Central Superior Services Examination. Incidentally, her unique honour was a question, in the examination, on her own poetry. In 1991, she did an MA in Public Administration from Harvard University, USA. 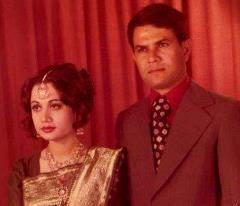 Perveen Shakir married a Pakistani doctor, Naseer Ali, with whom she had a son, Syed Murad Ali—but the marriage did not last long and ended in a divorce. 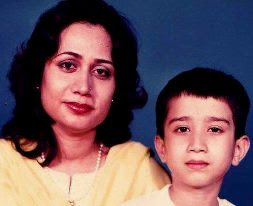 On Dec 26th, 1994, Shakir's car collided with a truck while she was on her way to work in Islamabad. 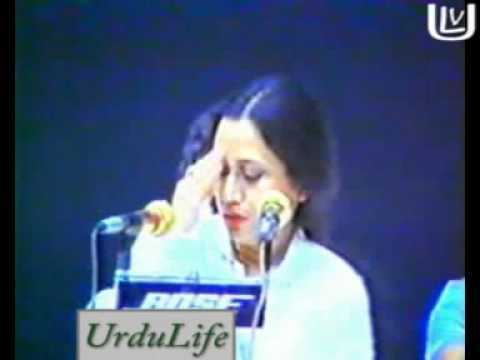 The accident resulted in her death, a great loss to the Urdu poetry world. The road on which the accident took place is named after her. 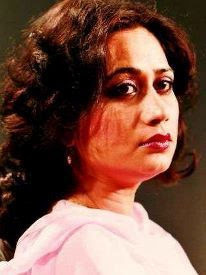 Fans of Parveen Shakir have woven conspiracy theories around her death, believing she was murdered, seeing the event in the background of Shakir's involvement in government affairs and her relations with high-profile government and political figures. 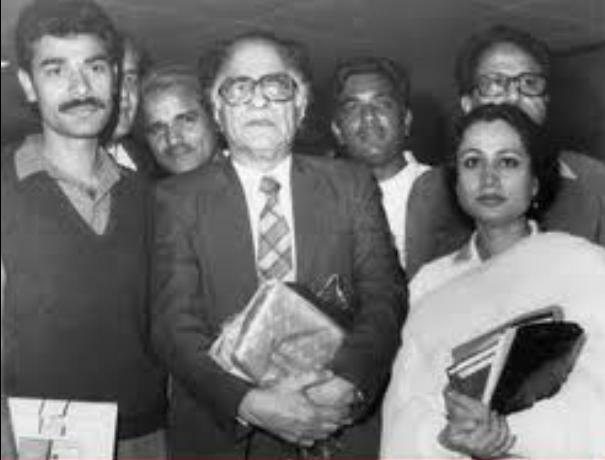 · Shakir started writing at a young age, penning both prose and poetry, and contributing columns in Urdu newspapers, and a few articles in English dailies. 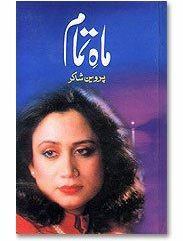 Initially, she wrote under the pen-name, "Beena". Shakir held two masters degrees, one in English Literature and one in Linguistics. She also held a PhD and another masters degree in Bank Administration. was appointed the second secretary, CBR in Islamabad. 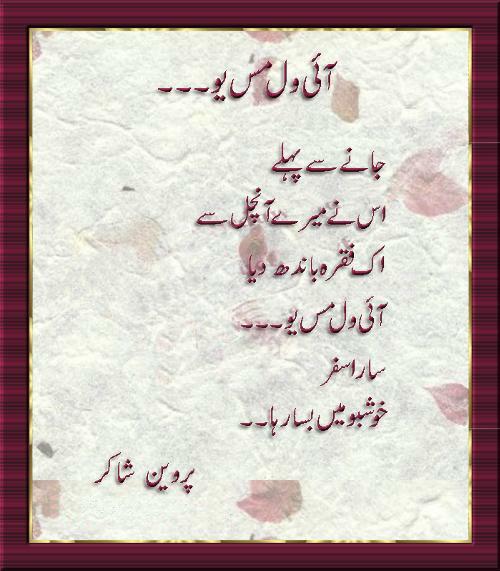 the prevalent ghazal [plural: ghazalyaat], and the other being free verse. 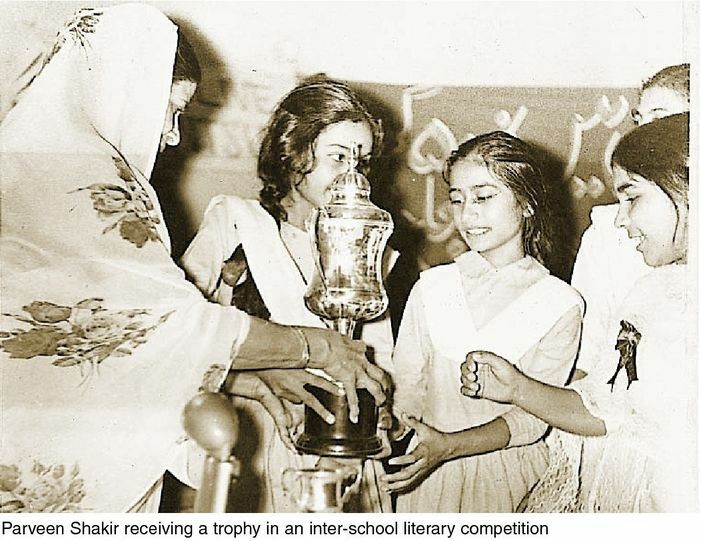 Shakir started writing at an early age and published her first volume of poetry, Khushbu [Fragrance], to great acclaim, in 1976. 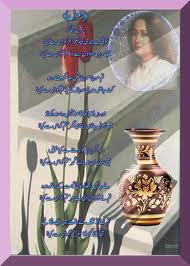 She subsequently published other volumes of poetry - all well-received - including Inkaar [Refusal], Sad-barg [Marsh Marigold], Khud Kalami [Conversing with the Self] and Kaf-e-Aa'ina [The Edge of the Mirror], besides a collection of her newspaper columns, titled Gosha-e-Chashm [The Sight Corner], and was awarded one of Pakistan's highest honours, the Pride of Performance for her outstanding contribution to literature. 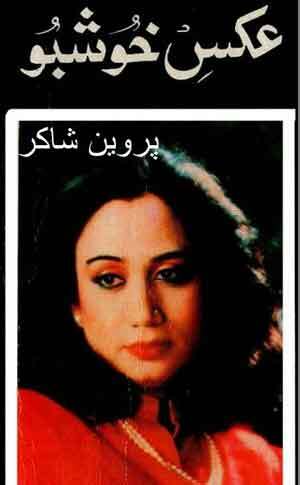 Shakir's first book, Khushbu (Fragrance), was published in 1976 and won Pakistan's Adamjee Award. 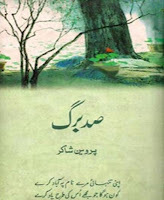 She subsequently published Sad-barg (Marsh Marigold), Khud kalami (Conversing with the Self), Inkaar (Refusal), Maah-e-Tamam (Full Moon) and Kaf-e-Aa'ina (The Edge of the Mirror), all to great acclaim. 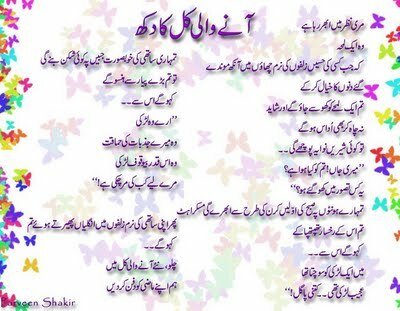 The most prominent themes in Shakir's poetry are love, feminism, and social stigmas, though she occasionally wrote on other topics as well. Her work was often based on romanticism, exploring the concepts of love, beauty and their contradictions, and heavily integrated the use of metaphors, similes and personifications. Arguably, Shakir can be termed the first poetess to use the word larki (girl) in her works—the male-dominated Urdu poetry scene seldom employs that word, and uses masculine syntax when talking about the 'lover'. 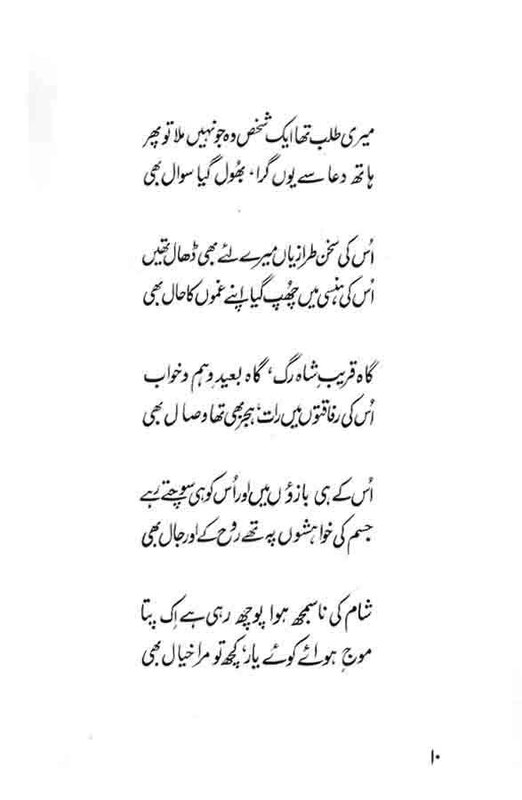 Similarly, she often made use of the Urdu first-person, feminine pronoun in her verses which, though extremely common in prose, was rarely used in poetry, even by female poetesses, before her. tradition with modern sensitivity", and mainly deal with the feminine perspective on love and romance, and associated themes such as beauty, intimacy, separation, break-ups, distances, distrust and infidelity and disloyalty. 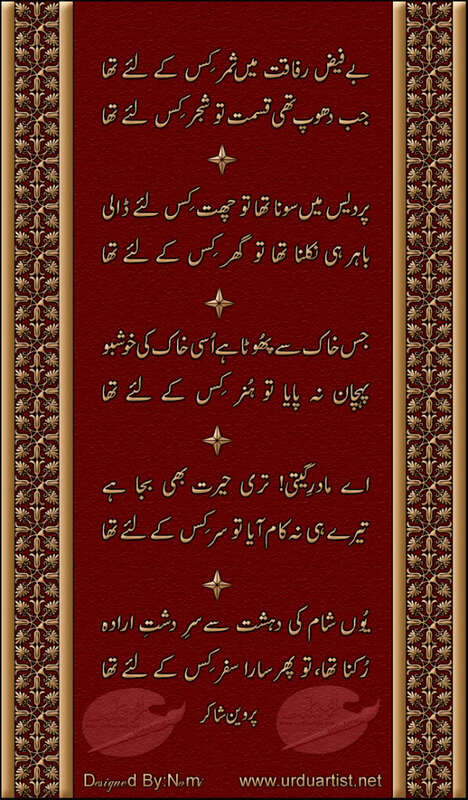 Most of Shakir's ghazalyaat contain five to ten couplets, often - though not always - inter-related. Sometimes, two consecutive couplets may differ greatly in meaning and context [For example, in one of her works, the couplet 'That girl, like her home, perhaps/ Fell victim to the flood is immediately followed by 'I see light when I think of you/ Perhaps remembrance has become the moon'. Shakir's ghazalyaat heavily rely on metaphors and similes, which are repeatedly and thought-provokingly used to bring force and lyricism in her work. 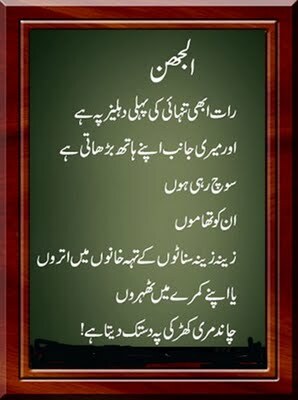 A fine example of this is seen in one of her most famous couplets, "Wo tou khushbu hai, hawaon main bikhar jaye ga/ Masla phool ka hai, phool kidher jayega?" [Translation: He is fragrance and would waft in the air/ the trouble lies with the flower - where shall the flower go?] where Shakir relates 'fragrance' to an unfaithful lover, 'air' to the unfaithful person's secret loves, and 'flower' to the person being cheated. Other metaphors Shakir commonly uses are titli [butterfly] for a Romeo, badal [cloud] for one's love, baarish [rain] for affection, and andhi [storm] for difficulties. 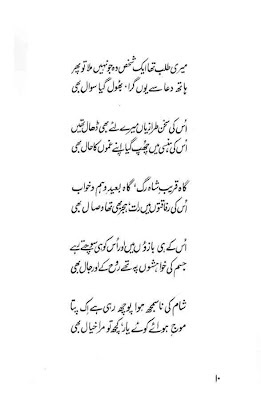 Some of Shakir's ghazalyaat or, more specifically, couplets, have gained an iconic status in Urdu literature. One of her most famous couplets if the one given above. 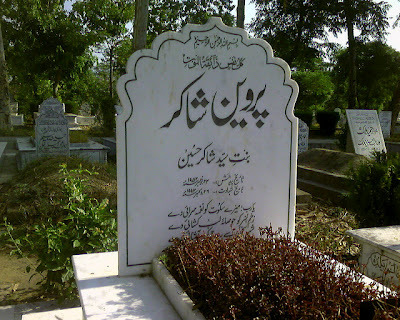 Another famous, Shakir couplet is "Jugnuu ko din kay wakt parakhne ki zid karain/ Bachchay hamaray ehed kay chalaak ho gaye"[They insist upon evaluating the firefly in daylight/ The children of our age, have grown clever], which is often quoted to comment on the often surprising knowledge and awareness of the 21st century child. 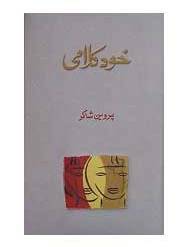 · As compared to her ghazalyaat Shakir's free verse is much bolder, and explores social issues and taboos, including gender inequality, discrimination, patriotism, deceit, prostitution, the human psyche, and current affairs. It is also much more modern and up-to-date. 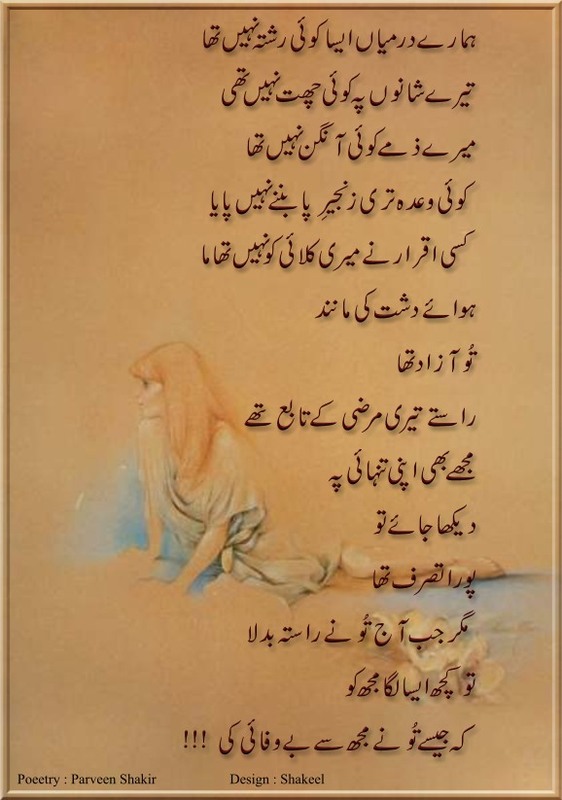 · Shakir is known for having employed the usage of pop culture references and English words and phrases, that have mixed up with Urdu, in her free verse - a practice that is both generally considered inappropriate, and criticized, in Urdu poetry. An example is the poem Departmental Store MeiN [In a Departmental Store], which is named thus despite the fact that there the term 'departmental store' could easily have been substituted with its Urdu equivalent, and where words like 'natural pink,' 'hand lotion,' 'shade,' 'scent' and 'pack' are brought into use, and references made to cosmetics brands like, Pearl, Revlon, Elizabeth Arden, and Tulip. Other examples are her poems Ecstasy, Nun and Picnic. 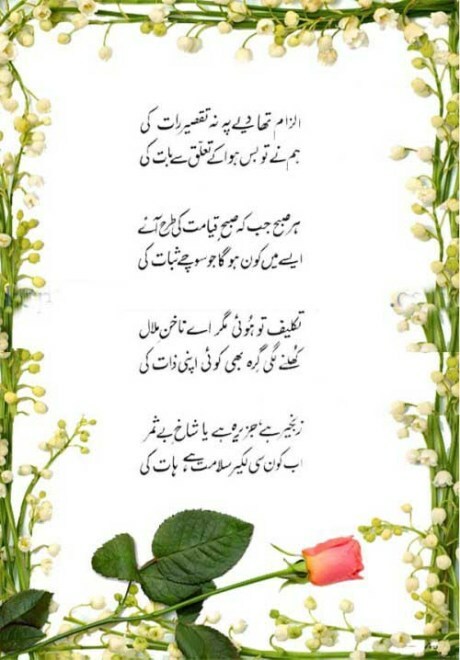 Shakir's free verse also contains a few, credited translated or inspired works i.e. poems that are translations of, or inspired by, other authors. Examples are Wasteland, a poem inspired by Elliot's poem of the same name, and Benasab Wirsay Ka Bojh [The Burden of Illegitimate Inheritance], a translation of W.B. Yeats's Leda and the Swan. 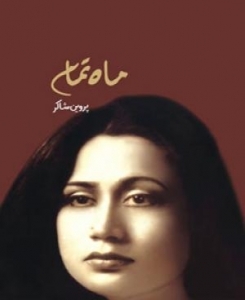 Shakir's poetry was well-received, and after her untimely death she is now considered one of the best and "most prominent" modern poets Urdu language has ever produced. Hailed as a "great poetess," her poetry has drawn comparisons to that of Iranian poet Forough Farrokhzad, and she is considered among the breed of writers "regarded as pioneers in defying tradition by expressing the "female experience" in Urdu poetry." 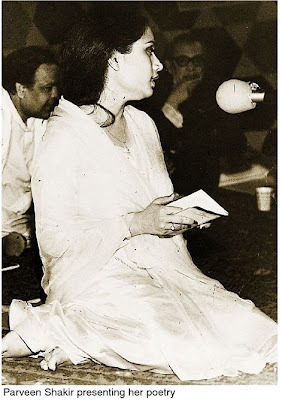 A source states, "Parveen ... seems to have captured the best of Urdu verse ... Owing to [her] style and range of expressions one will be intrigued and ... entertained by some soul-stirring poetry." Another praises "her rhythmic flow and polished wording." 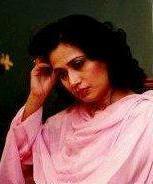 Literary figure Iftikhar Arif has praised Shakir for impressing "the young lot through her thematic variety and realistic poetry," for adding "a new dimension to the traditional theme of love by giving expression to her emotions in a simple and pellucid style," and using a "variety of words to convey different thoughts with varying intensities." 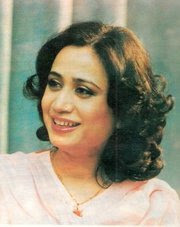 The Delhi Recorder has stated that Shakir "has given the most beautiful female touch to Urdu poetry." 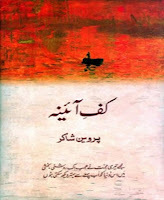 Shakir's first book, Khushbu, was awarded the Adamjee Award. 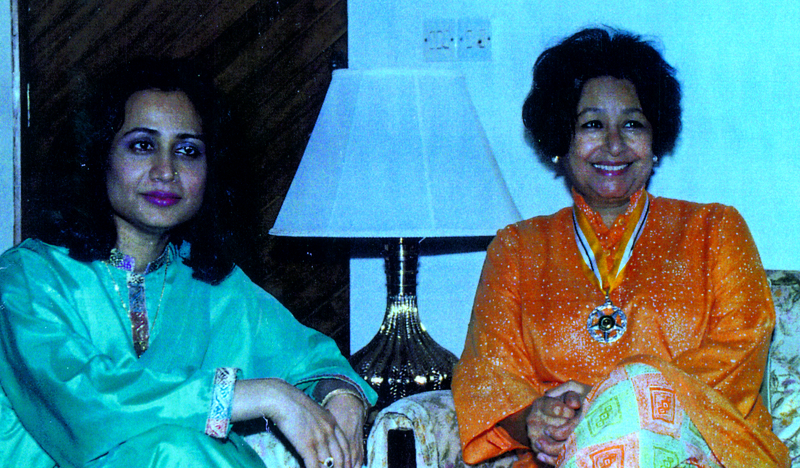 Later, she was awarded the Pride of Performance, one of Pakistan's highest honours. 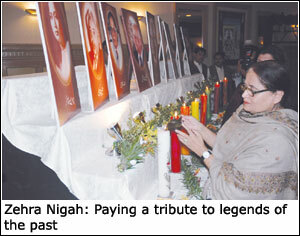 Upon her death, the Parveen Shakir Trust was established by her close friend, Parveen Qadir Agha. 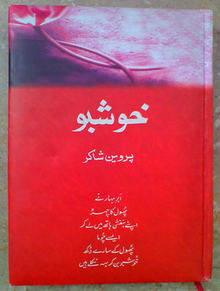 The Parveen Shakir Trust organizes a yearly function and gives out the "
Following is a list of Shakir's published books. A translation of each's title follows in italics. rings in the trees, echoes. and smile thinking of someone. The breeze is a scarf, again the light-pink. in the season I met you. though these wounds had healed already. these houses shaken to their foundations? as if our meetings had been done. the feet bruised on the way. with a slight movement of the hand. do not have the same tones. coal into the burning furnace. a suicide pact in full knowledge. He is the fuel for this furnace.